You may well have heard some talk about the Nurse Jamie EGF Stem Cell Complex, beauty guru goddess Tati swears by it for a start. Epidermal Growth Factors are said to be a bit of an alternative to retinols, increasing cell turnover, minimising the appearance of fine lines and wrinkles, and restoring the elasticity and suppleness of our skins, without the irritation. Swanicoco are a Korean brand I love - in fact they're included in my 7 Korean Brands Every Beauty Lover Must Try post if you fancy hearing a little more. Their EGF Pure Ampoule is one of the best serums I've tried. It's a wonderfully pure, concentrated formula, containing 99% of the active ingredient, at almost half the price of Nurse Jamie. Feel free to have a read of my 7 Anti-Aging Elixirs for more on my experience of the Swanicoco (and don't fret about the bottle, the square shape is just the newly improved version). For 'pore problems', a BHA exfoliant is perfect to unclog pores and lessen blackheads and breakouts. The Paula's Choice Skin Perfecting 2% Liquid contains salicylic acid, an oil-soluble exfoliant that can help shed dead skin both on the surface and inside the pore, as well as green tea to soothe and protect. The Cosrx BHA Power Liquid contains 4% betaine salicylate, a gentler version of salicylic acid, as well as willow bark water, a naturally occuring BHA. Thanks to some welcome extras like panthenol and sodium hyaluronate, I find this serum to be gentle enough on my skin for everyday use. It's also more like half the price of the Paula's Choice! Head to my in depth review here for more details. Diorsnow's blue Base De Teint is a colour-correcting makeup base that offers sun protection but primarily brightens the complexion. It's also pretty difficult to source, which is where Klair's Blue Sun Lotion (and here for the US) comes into play. Both contain the blue pigments to brighten skin, actually they're pretty identical in colour, and both offer an SPF (35 vs 40), although the Dior is much more runny, whilst the Klair's is creamier and thicker in texture. Now I'm well aware that a mist and a serum are quite a different thing, but if you can put that aside, the active ingredients in both of these products are actually remarkably similar, and will have a similar effect on your skin. In the Odacite Mint + Green Tea Treatment Mist, it's mint, green tea, glycerin and willow bark extract, and in the Neulii Green Tea Pore Tightening Serum (discounts currently available at checkout!) it's mint, green tea, willow bark water and sodium hyaluronate, so clearly, very similar! I love the combination in the Neulii serum, it's wonderfully cooling and refreshing from the mint, soothing from green tea and anti inflammatories, and works wonders on tightening pores - and you get 100ml in a bottle, double the amount of the Odacite spray. The serum is actually very viscous and liquidy, you could almost decant it into a spray bottle and use as a mist - another reason why I feel these would make for good dupes. Another Nurse Jamie product to talk about now, this time their Uplift Massaging Beauty Roller. And again, it's a dupe from Swanicoco. The Nurse Jamie holds 24 massaging stones containing tourmaline quartz to tone, tighten and energise skin, and replicate movements from a top quality facial. Just by looking at the Swanicoco you can see it's a dupe! Holding 48 stones with germanium this time, the Swanicoco Germanium Beauty Roller is designed to do exactly the same thing. I'd love to know the finer differences between germanium and tourmaline's effects on the skin, if any, but they're both allegedly to do with negatively and positively charged ions etc so appear to be similar in that sense. I think this kind of product can be surrounded with skepticism, and requires you to just 'take the plunge' and purchase, so if you fancy saving around £25 on your 'whim purchase', you might want to try the Swanicoco instead. By Terry released their Baume De Rose skincare line fairly recently and I was pretty excited to give it a go. The scent and skin soothing properties of rose always peaks my interest. There's no doubt, their cream in particular feels beautiful, silky and delicious and I was pretty tempted just to get the full size at £55, but actually, looking at the ingredients I'm a little put off. There are quite a few preservatives, higher up in the ingredients list, and it contains eugenol, a controversial ingredient I'd generally like to avoid if I can, and really in general, for the price tag, I'm expecting a little better. I'm not saying the Nature Republic Bulgarian Rose cream is a perfect formula, but there are fewer preservatives, more botanical extracts, and you get the lovely scent and rose as the By Terry, but at a much lower price point - about a fifth of the price in fact! The Nature Republic has a bit more of a gel-like texture too so great if you want the hydration, perhaps a pass if you want something rich and emollient, but a worthy alternative - they even look quite similar with the silvered lid and frosty pink jar. My last dupe for today is a little bit of a curved ball. For any Kbeauty lovers out there, you'll have heard of LJH, or Leejiham, and their Vita Propolis Ampoule. I love honey and bee-derivative products for their glow factor primarily, but serums like this also revitalise skin, help with tone and texture, and improve dullness - they're such a good staple to have in your skincare collection. Turns out there are many of them, so I wanted to share a few alternatives you could try, all of them more affordable. Firstly, here are some ingredients lists for your perusal. I particularly enjoy Cosrx products, and their minimal ingredients list stands out to me. The Scinic includes the largest amount of propolis (95%), as well as the niacinamide and honey etc, although I'm not sure why they bothered to add the other 265 ingredients as they must be in the tiniest percentages?! All four products, by their nature, have a similarly moist and hydrating texture, and leave a slight tackiness on the skin, which is nothing offputting. Propolis extract 50%, Portulaca Oleracea Extract, Hippophae Rhamnoides Fruit Extract, Panthenol, Rosa Centifolia Flower Water, Niacinamide, 1, 2-Hexanediol, Ethyl Ascorbyl Ether, Hamamelis Virginiana (Witch Hazel) Bark/ Twig Extract, Centella Asiatica Extract, Carbomer, Arginine, Spirodela Polyrrhiza Extract, Hydroxyethylcellulose, Dipotassium Glycyrrhizate, Sodium Hyaluronate, Adenosine. Propolis Extract 80%, Butylene Glycol, Glycerin, Betaine, 1,2-Hexanediol, Cassia Obtusifolia Seed Extract, Sodium Hyaluronate, Hydroxyethylcellulose, Carbomer, Panthenol, Arginine. I also want to throw in Banila Co's honey serum, because it's close enough, with the niacinamide, honey, royal jelly, propolis and all 'bee-like' ingredients, and mainly because I absolutely love the stuff. 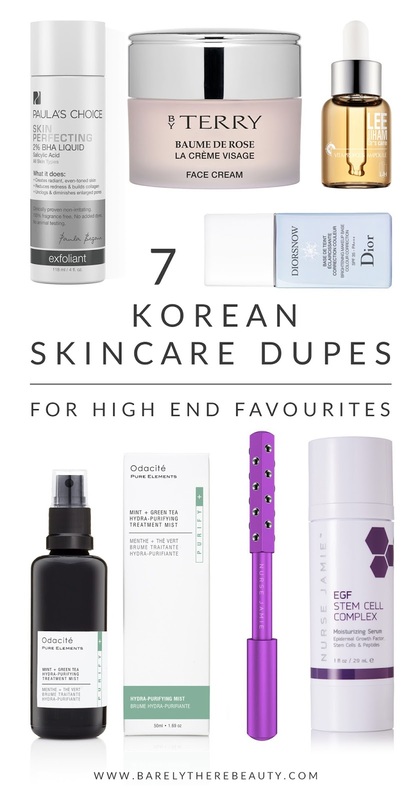 I mentioned in my 7 Korean Beauty Brands You Must Try post, that I think I'm on my third bottle of this, which is rare as I rotate my skincare so much, and have so darn much of it! Collagen extract, glycerin, water, methylgluceth-20, polyglycerin-3, niacinamide, ethanol, honey extract, aureobasidium pullulans ferment, theobroma cacao (cocoa) extract, royal jelly extract, propolis extract, chrysanthellum indicum extract, plukenetia volubilis seed oil, argania spinosa kernel oil, olea europaea (olive) fruit oil, anthemis nobilis flower extract, oenothera biennis (evening primrose) oil, limnanthes alba (meadowfoam) seed oil, helianthus annuus (sunflower) seed extract, calendula officinalis flower extract, pentylene glycol, PEG-8, butylene glycol, glyceryl polyacrylate, PEG-60 hydrogenated castor oil, adenosine, tromethamine, caprylic/capric triglyceride, octyldodecanol, hydrogenated coco-glyceride, sodium starch octenyl succinate, maltodextrin, calcium pantothenate, hydrogenated lecithin, sodium ascorbyl phosphate, tocopheryl acetate, pyridoxine HCI, silica, xanthan gum, carbomer, disodium EDTA, phenoxyethanol, fragrance. Wonderful post Jennifer! While I'm a huge fan of the Odacite mists, I went through the bottle way too fast - and I didn't even think I was using that much! The Paula's Choice Skin Perfecting 2% Liquid was the first BHA I ever tried and ugh it was horrible - oily and didn't do anything for my skin. The Cosrx version is superior in every way! I really liked this post. It was very nice to know that there are dupes out there for skincare products. I think that l might give the Nature Republic a try. It sounds awesome. I just wanted to mention one product that I absolutely love which you might want to check out if haven't already. I am a huge fan of Benton's Snail Bee High Content Essence. It has both snail and bee propolis, along with Arbutin peptides and adenosine. This stuff has a nice texture and absorbs with little to no stickiness.